Life goes on, we are told, even after a national tragedy. And one of the consolations of a national tragedy, we’re also told, is that great art will come out of it. Perhaps it will. 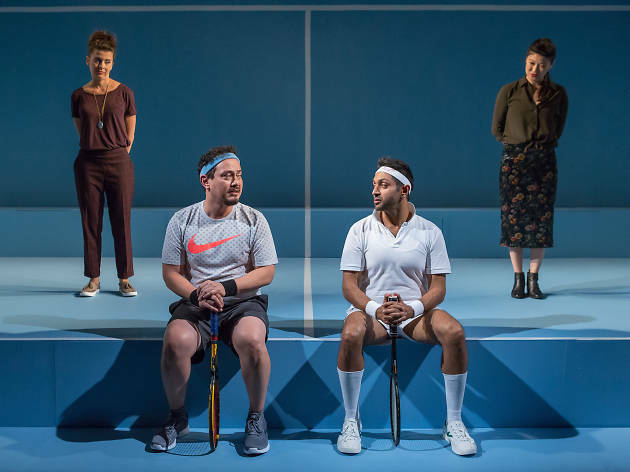 But while we wait, we needn’t settle for wearyingly so-so art like Andy Bragen’s Don’t You F**king Say a Word, a comedy about two New York couples and a tennis game gone wrong. Russ (Michael Braun) and Brian (an amusingly smug Bhavesh Patel) have a friendship of sorts that consists entirely of tensely competitive morning tennis games. They have met through their partners—respectively, Kate (Jennifer Lim) and Leslie (Jeanine Serralles, sly and prickly as always)—who were college acquaintances on different tiers of the social pecking order. 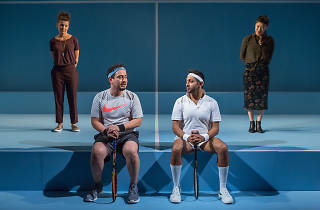 On a spare set that suggests a tennis court, the men grunt and strain to outdo each other, while the women narrate the story (such as it is) directly to the audience. Don’t You F**king Say a Word is full of such pop-psych noodling, but barely sketches the characters’ actual relationships. In the end, it’s so generic and familiar that the warning of its truculent title seems descriptive. The play has nothing to say. 59E59 (Off Broadway). By Andy Bragen. Directed by Lee Sunday Evans. With Michael Braun, Jennifer Lim, Bhavesh Patel, Jeanine Serralles. Running time: 1hrs 20mins. No intermission. Click here for full ticket and venue information. Keep up with the latest news and reviews on our Time Out Theater Facebook page.